As Seattle-area residents change their daily habits to try to keep the region's arteries flowing through the Highway 99 shutdown, the nerve center of the entire system sits in an unassuming office building in a leafy Shoreline office park. Traffic is chaotic, frenzied, loud. Traffic management is calm, composed, hushed. As Seattle-area residents change their daily habits to try to keep the region’s arteries flowing through the Highway 99 shutdown, the nerve center of the entire system sits in an unassuming office building, behind a grocery store, in a leafy Shoreline office park. From there, Washington State Department of Transportation (WSDOT) engineers, technicians and tweeters monitor traffic from the Pierce County line to the Canadian border, dispatching incident response teams, changing roadside warning displays and adjusting the timing on metered onramps. On Wednesday, five WSDOT employees staffed the transportation management center, a tech wonderland with a wall of 112 TV screens and two dozen workstations, each with another seven or eight screens of its own. Those TV screens are fed by about 900 traffic cameras, stretching across hundreds of miles highway. While morning commuters inched toward their destinations, in slow but unexceptional traffic, the transportation management center was serene — silent but for the occasional burble of muffled radio chatter. 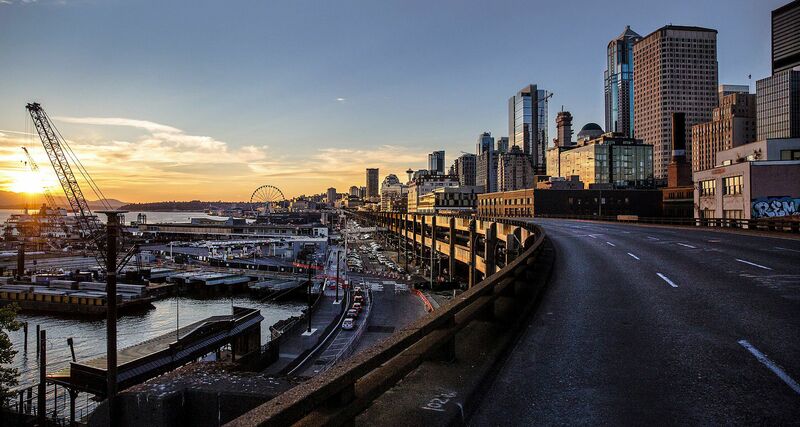 Wednesday morning’s commute, the third day of the viaduct shutdown, was once again noteworthy for how ordinary it was. Viadoom was, again, mostly a viadud. Some routes saw commutes longer than normal, but nothing obscene. The area’s commuters, so far, have adjusted their routines enough to spare themselves the extreme delays that had been predicted — and could still be coming if people drift back to their cars and rain moves in Thursday as forecast. Right around 7 o’clock on Wednesday morning, a vehicle stalled on southbound Interstate 405, blocking the HOV lane near Bothell. Working the radio dispatch in the transportation management center, Keli Thomas noticed the blockage. She and Bryce Frisher, a traffic flow intern and University of Washington engineering student, adjusted traffic cameras to zoom in on the incident and put it on the tech center’s big, central screen — nine times the size of the other monitors. Frisher talked with Ally Barrera, a communications officer, and together they alerted the traveling public. By 7:03, Barrera had sent a tweet to WSDOT’s 466,000 followers. Eight minutes later she sent an update. Southbound travel times had been faster than normal, but one stalled car can muck things up. The blockage backed things up to stop-and-go conditions for nearly five miles. Frisher adjusted, as needed, the digital roadside signs that notify drivers of upcoming blockages and delays, to help avoid cascading crashes. Meanwhile, Thomas got on the radio with one of WSDOT’s incident response teams. WSDOT’s Northwest region (King, Snohomish, Skagit, Whatcom and Island counties) has 21 such teams, five more than normal to help handle the viaduct shutdown. Each team is actually a single technician in a souped-up pickup (cowcatcher-style front bumper, tow cable), whose job is to clear roadway blockages as quickly and safely as possible. “We’ll push, pull or drag to get this clear,” Ken Buretta, a Snohomish County incident response technician, previously said about the work they do. The stalled car was cleared by 7:15 (average clearance time is 13 minutes), but lingering backups persisted for another 20 minutes or so. The transportation management center is staffed 24 hours a day with, at minimum, an on-duty engineer and another staffer to monitor the region’s highway tunnels. Thirty of the center’s 112 monitors are devoted full time to the tunnels, including nine for the soon-to-open Highway 99 tunnel. Virtually every inch of the tunnel is covered by one of about 300 cameras.